The H. P. Lovecraft Historical Society is running a Spring Sale from April 19th to 22nd with 20% off on all orders of two or more items. Highlights from their Games & Props section include: digital files for handouts/templates Vol. 1 & Vol. 3; their font set; props for Horror on the Orient Express and Masks of Nyarlathotep; and more adventures in Arkham County props. They're also selling the slipcase of the new Masks of Nyarlathotep, separately or as a combo deal with their prop set. Or you can go all-out and splurge on the famous Angell Box prop set or the Super Deluxe Limited Edition of Masks of Nyarlathotep (Dark Adventure Radio Theater, props, costume, campaign journal). 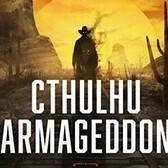 In a widely expected move, the HPLHS have announced that their next Dark Adventure Radio Theatre Call of Cthulhu campaign audio adaptation will be Chaosium's Masks of Nyarlathotep. Due out this summer around the same time as the print edition of the new CoC7e version of Masks, i.e. for Gen Con - early August. The HPLHS refuse to be drawn as to whether there will also be a deluxe edition (as with 2016's DART: Brotherhood of the Beast). I'm sure it would be jolly nice if there was. No details on pricing yet but Masks is a big campaign to adapt, especially with the rumours of what's in Chaosium's new 2018 edition. Now in our 19th year, 2017 sees a few changes coming up for "Olde Yoggie" and one of those is the re-opening of our Little Shop of Cosmic Horrors under the moniker of "Arkham Market" which will offer items created by the fine artisan shoggoths we host in our dungeons. Initially we're re-activating some of our previous stock items (which will include the notorious well received Lovecraftian Letters), but look out for new and exclusive items as we head further into the year. Your browser does not support the audio element. For sale, The Star Chamber, Delta Green Scenario. In good condition £6 Posted, PayPal. For straight sale, a copy of Horrors Beyond: Tales of Terrifying Realities. This is a rare first edition hardcover printing of the book published by Elder Signs Press in 2005 and signed by the late C. J. Henderson (a contributing author). This book has tight binding, no writing or mark-ups, no torn or creased/folded pages, no foxing, and exhibits only minor shelf wear on the dust jacket (which is, obviously, present). Asking $100 obo, including shipping. Shipping is via Priority Mail with insurance and tracking to the continental US (sorry, no international shipping). I accept PayPal only (I will invoice you) and will ship within three business days of payment receipt, providing a tracking number at that time. Hello! I'm on a mission to clear out my studio, and I'm looking to sell my complete collection of Cthulhu Britannica London. The collection is all in excellent condition and comprises: • The London Boxed Set (The handouts have been removed from the punched sheet, but otherwise "like new") • The Curse of Nineveh Campaign • Cards from the Smoke card set • Kickstarter Exclusive Postcard Set • World War Cthulhu London • Journal of Neve Selibuc • Journal of Reginald Campbell Thompson • Character sheet pad (Shrinkwrapped) As the cover artist and art director I can get any or all of the books signed if that's enticing. Or not if it isn't! I'm looking for £300 for the set including UK shipping. International shipping by arrangement at cost. Drop me a DM or email via my site https://jonhodgsondesign.com if you'd like to buy! Thank you! https://nerdist.com/article/10-spooky-valentines-gifts/ Eat it before it eats you. Wonder if this candy shoggoth is still available? Clearing out the last (I hope) bits of the bins overtaking my dining room. Stormbringer, OSR, non-TSR, AD&D, GURPS, Call Of Cthulhu, Cyberpunk, MERP, Runequest, Glorantha, Warhammer, and more... (A few items still to list - Dragon run, Dungeon run, Warhammer novels lot) http://www.ebay.com/sch/smrubin/m.html CoC items: The first two versions of the Keeper's Screen Call Of Cthulhu Companion Cthulhu Brittanica Keeper's Companion 1 + 2 Terror From The Stars Cthulhu By Gaslight box set Also some related bits like The Laundry, No Security, etc. Or at least part of it. This was HPL's home for many years. Full details, including many photos, online at https://www.redfin.com/RI/Providence/598-Angell-St-02906/unit-1/home/51707241 It was newly listed for sale yesterday, i.e. 30th January 2019.